This pretty green Patrician Spoke depression glass 10 1/2 Inch Grill Plate was made by Federal Glass from 1933 to 1937. The Plate is in very good condition with no chips, cracks or scratches. Be sure to search our other Patrician items available. We guarantee items to be as described. THANK YOU. 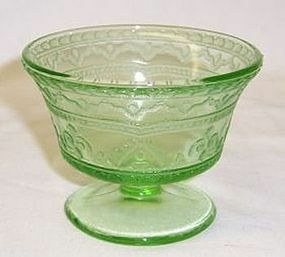 This pretty green Patrician Spoke depression glass Footed Sherbet was made by Federal Glass from 1933 to 1937. The Sherbet is in very good condition with no chips, cracks or scratches. Be sure to search our other Patrician items available. We guarantee all items to be as described. THANK YOU. 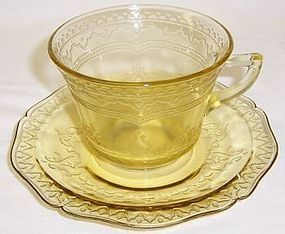 This pretty amber Patrician Spoke depression glass Cup and Saucer Set was made by Federal Glass from 1933 to 1937. The Cup measures 3 5/8 inches in diameter X 2 3/4 inches high. The Saucer measures 5 3/4 inches in diameter. Both the Cup and Saucer are in very good condition with no chips or cracks. Be sure to search our other Patrician items available. We guarantee all items to be as described. THANK YOU.